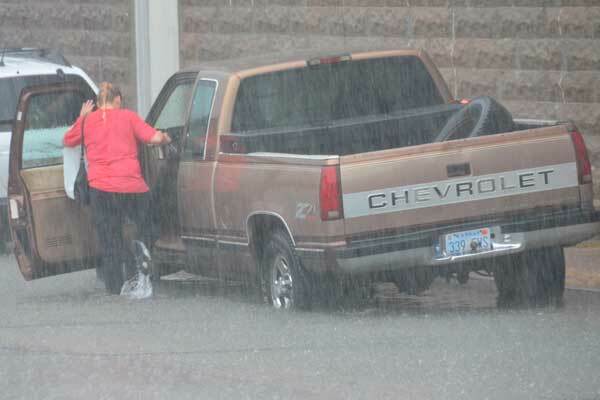 Up to four inches of rain in less than two hours Monday inundated Marion County, sending the Cottonwood River 131/3 feet over flood stage Tuesday and threatening the life of a motorist trapped when his car was swept away and submerged on Nighthawk Road. Kevin Steele of Marion says he is lucky to be alive after rushing water pushed his Pontiac Grand Prix off Nighthawk at 5 a.m. Tuesday. The car traveled 200 feet down a ditch, hit a pole, submerged, and lodged hood-first into a culvert, where it remained 12 hours after the accident. 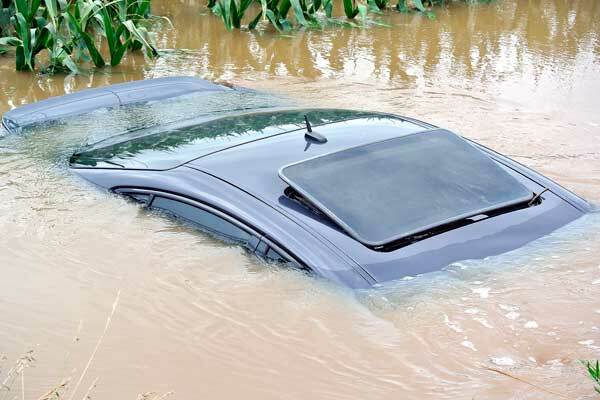 “The pole gave me time to get my bearings and get the window open before the car became completely submerged in deeper water,” Steele said. “When it came down to it, it was either fight to survive, or die, and I choose to fight. The call, however, was misunderstood, and Hillsboro police responded to a spot 8 miles away. Steele’s wife, Tina, was first on the scene. “Thank God my window opened because if it didn’t they wouldn’t have found me until the water receded around the car,” Steele said. Steele had driven down Nighthawk hundreds of times to get to work at American Tire and Distribution in Wichita but had never seen it flood. His cell phone and wallet are still in the car. Steele’s mother, Kay, said it was a lucky day, and she is thankful he was able to get the window down. Steele hoped to have the car out of the ditch Tuesday night. 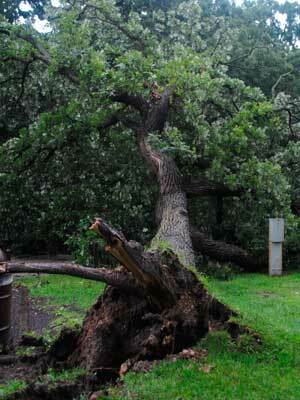 Water had receded enough to show the trunk and roof at 3 p.m. Tuesday. “The situation will be more real in a few hours when we can see more of the damage,” he said. “It’s going to be a chore to get it out.”Floodwaters bisected the county lake, with water pouring into the lake over Lakeshore Drive at the northeast and southwest ends of the lake. 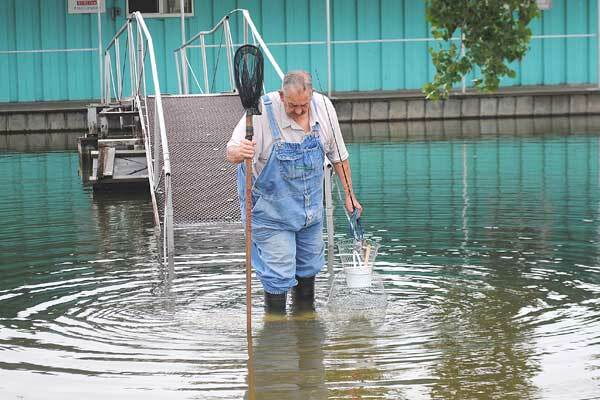 “There was about three feet of water over the road at the concrete slab on the north side of the lake,” lake superintendent Steve Hudson said. “It was totally impassable. 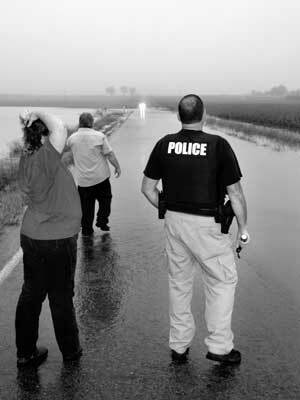 Some of the people there said they have never seen the water run that heavy at that level. “If it goes over the cement slab and the spillway, the lake is effectively cut in half, and the ambulance has to enter the east side of the lake from Highway 77,” he said. 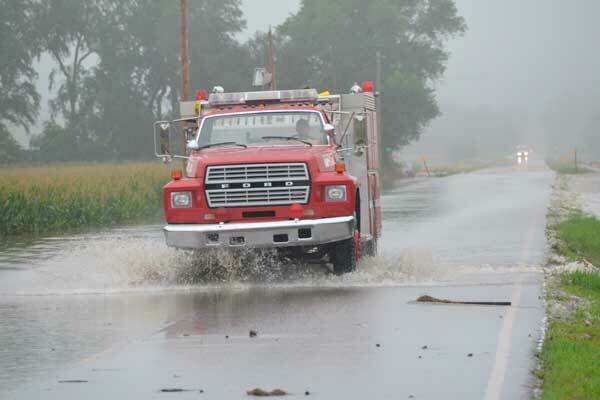 It wasn’t at the lake that roads became a problem for the ambulance, but Marion ambulance needed directions to a call near Peabody to avoid flooded roads early Monday afternoon. An ambulance worker requested a road grader to reduce the risk of getting stuck on the waterlogged road. The water level at Marion Reservoir rose about 3 feet from Monday to Tuesday. The reservoir gained about 6 billion gallons of water in 24 hours as it filled from conservation level to flood control level. “It’s good to get the water levels back to normal,” ranger Emily Kaufman said. Both lakes reported debris in the water that could be a threat to boats. “I have observed several 6- to 8-foot logs, 12 inches in diameter, already out in the lake,” Hudson said. 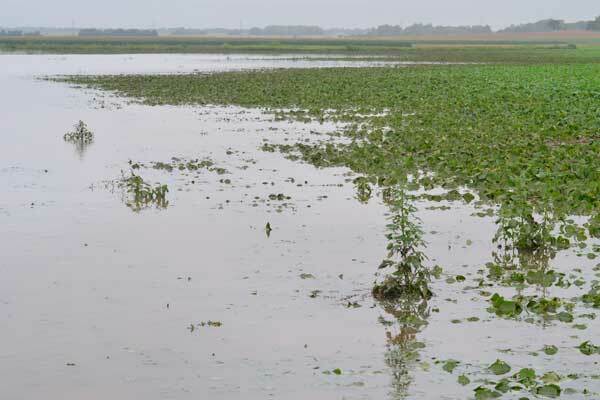 The heavy rains will help control blue-green algae at the reservoir in the short term, but it isn’t clear what effect they will have in the long run, said Tom Stiles of Kansas Department of Health and Environment’s watershed management division. Water flowing in could have refueled the algae problem by flushing those same nutrients into the reservoir, though. Regular rain should cut down the chance of blooms, but if August is hot and dry, algae could come back, Stiles said. 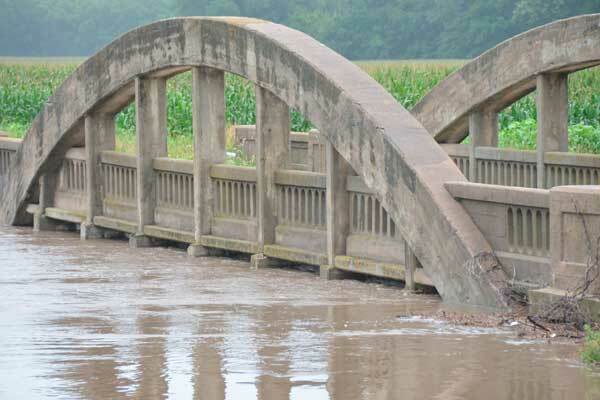 The Cottonwood River overflowed near Florence, inundating fields of corn, soybeans, and hay. Other areas were hit similarly hard. 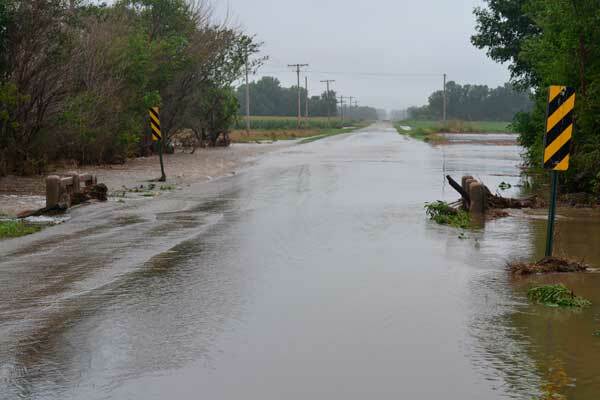 “Every place that I farm is underwater,” said Jon Thole, who farms north of Marion. “I don’t know how bad the damage is because I can’t get in to see how bad it is. 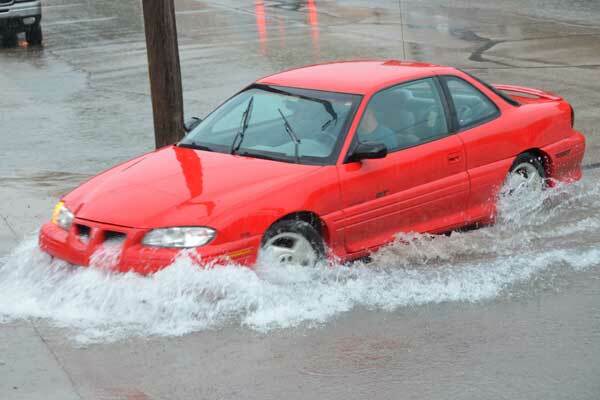 The road is covered with water. “With a flash flood like that, there was nothing we could do to prepare,” he said. 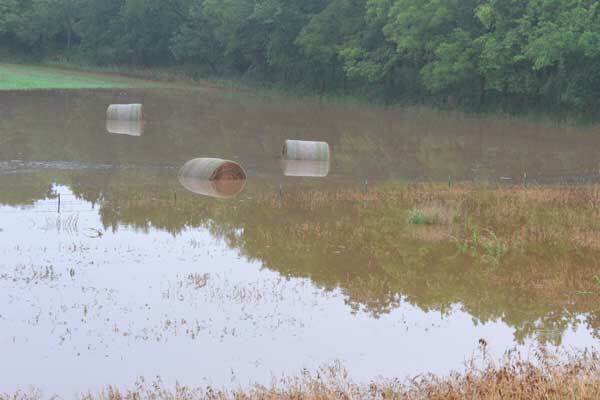 The rain will be a boon for farmers whose fields weren’t flooded, but there can be too much of a good thing, extension agent Rickey Roberts said. “We need it to dry now,” he said. “We don’t need any more rai. We need the sun to come out and try to get some drying action going on. “There’s an old saying that it takes a flood to break a drought, and I think we finally broke the drought,” Roberts said. The exact effect on crops won’t be known until fields dry, which may take weeks, he said. “We have to get through August yet, but maybe for the first time in a few years here we’re going to have a good bean harvest,” he said. John Ottensmeier, elevator operator at Cooperative Grain & Supply in Marion, said corn won’t benefit much from the rain. “It will be good for beans and milo, but corn made up its mind earlier, by wheat harvest,” he said. 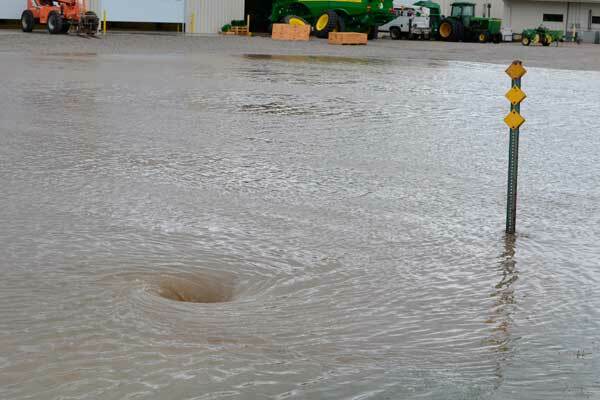 Ottensmeier said the rain would also be good for cattle ranchers, filling up cattle ponds. Meteorologist Ken Cook with the National Weather Service said the storm was caused by a stalled front over Kansas with warm, moist air coming from the south.